It was a carol service with a difference. Truly a blessed night – a night where the joyful singing of Christmas carols and listening to spiritual reflections reached its crescendo with the Adoration of the Lord Jesus, the Messiah! The above mentioned evening of carols and worship presented by the Community of The Risen Lord (CRL) was held at St. Joseph’s College Auditorium on December 15, 2018 from 5.00 p.m.to 8.15 p.m. The three-hour programme comprised of 3 segments, namely, the singing of Christmas carols, nativity play and Adoration of the Lord Jesus Christ. The service which was held under the patronage of Rt. Rev. Dr. Raymond Wickremasinghe, the Bishop of Galle (who along with Rt. Rev. Dr. Emmanuel Fernando, the Bishop of Mannar oversee the CRL and give spiritual guidance) commenced with a short prayer by Rev. Fr. Roy Clarence, the National Director of the Commission for the Laity. Thereafter, His Lordship Bishop Raymond Wickremasinghe delivered a very meaningful Christmas message highlighting that Christmas was not Christmas until and unless Jesus comes into our hearts. His Lordship also spoke of the importance of supporting each other in prayer – very specially the need for continuous prayers for our country at this critical time of political turmoil. The simplicity and humility with which the bishop delivered his message, no doubt, touched the hearts of many. It was followed by a unique felicitation of Rev. Fr. Dudley Attanayake of the Ratnapura Diocese, who, despite his age (79 years) has been actively involved with CRL for over 10 years, hearing confessions, offering Holy Masses and imparting the Eucharistic Benediction at the many weekly prayer services and four-step retreats (This indeed was a very touching moment for Fr. Dudley who was totally taken by surprise when he was lovingly led to the stage to receive the felicitation award from Bishop Wickremasinghe). 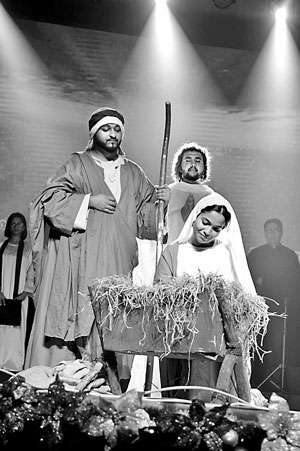 The nativity programme which followed was an extraordinary presentation. It covered the Annunciation, the Journey of Mary and Joseph to Bethlehem, the Birth of Jesus, the Announcement of the Glad Tidings to the Shepherds by the Angel and their visit to the Manger (being the first “invited visitors” of Baby Jesus), and the stargazing of the three Wise-men and their visit to worship the Divine Babe of Bethlehem. There were spiritual reflections based on the significance of each of these events in today’s context. The uniqueness of this segment was that it explained God’s loving presence in every situation and highlighted that as God was in control of every situation, we could face all exploitations and struggles of this world, by giving Him the first place in our lives. Short video presentations displayed on the large LED wall provided the background for the live skits and enabled the congregation to marvel at God’s Plan of Salvation, journeying from the Creation to the Birth of the Messiah. Finally, the Adoration of the Messiah was conducted by Rev. Bro. Lalith Perera, Director of the CRL – who led the entire congregation to a deep personal experience of the presence of the Messiah in the hearts of every individual. He explained that, when we were crushed by the cares of this world, we need to remember that the invitation of God comes to people like the Shepherds of Bethlehem (who represented the poor and the downtrodden on that first Christmas night), and that all those in this category are blessed because God comes in search of such people. Also, our country and its leaders were offered to God in intercession so that God’s presence and the kingdom values would prevail in our blessed motherland. His reflection led the entire congregation to adore and worship the Lord Jesus, and concluded with the melodious, emotional and heart-warming rendition of “Oh Holy Night” by the choir and the congregation. The entire service was very well-planned, organised and presented. It was conducted in English and Sinhala with a summary given in Tamil. 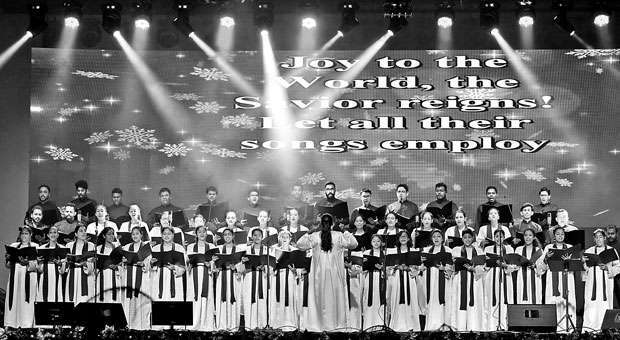 The Christmas carols were sung in the three languages and the joyful congregational singing was made possible by the display of the lyrics on the LED wall. The lively choir and band consisted of 60 youth from Colombo, Kalutara, Moratuwa, Wattala, Negombo, Wennappuwa and Kegalle. The choristers, musicians and the young men and women who performed at the nativity scenes gave a tremendous display of their God-given talents. A vast array of lighting technology was used to effectively communicate the significance of each segment. It is my prayer that this “Come, Let us Adore HIM” service would become a trendsetter for meaningful carol services in the future.